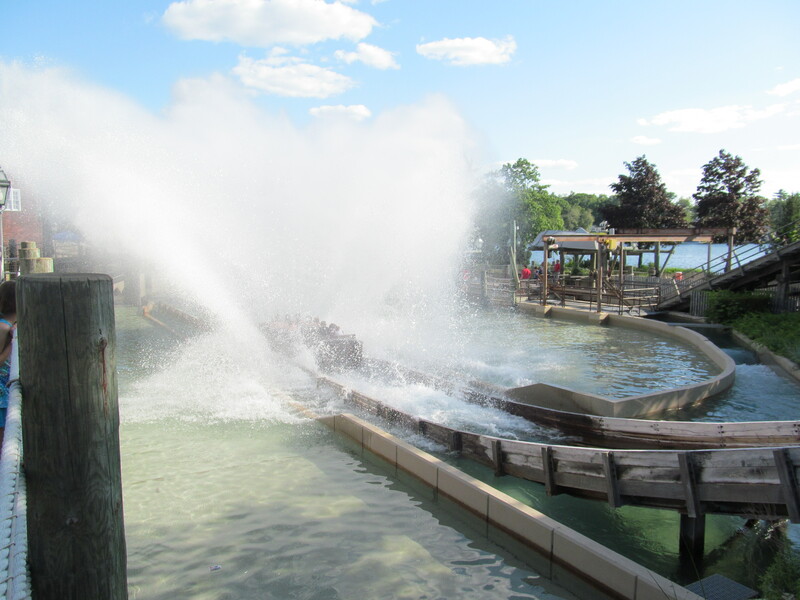 The Second portion of our look at the Shoot the Chute water ride. 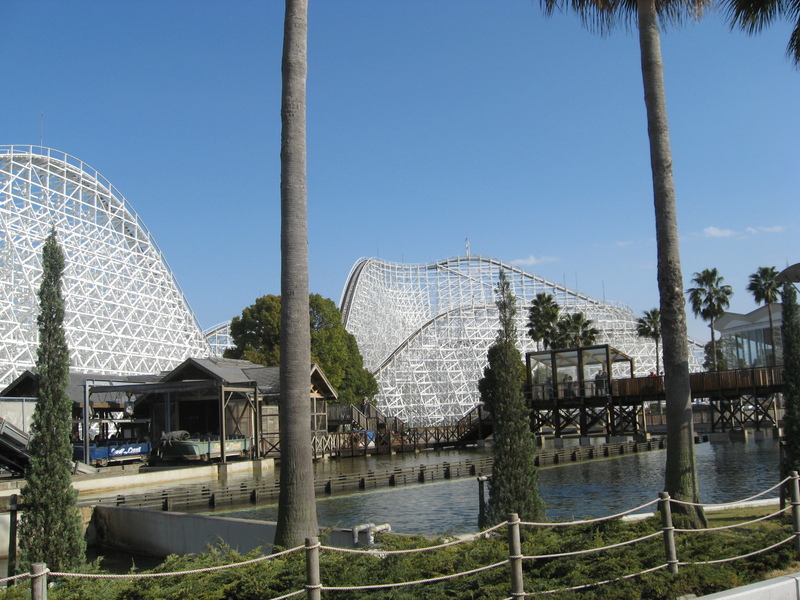 In 1986, Six Flags purchased the first two O.D. Hopkins Shoot the Chutes. 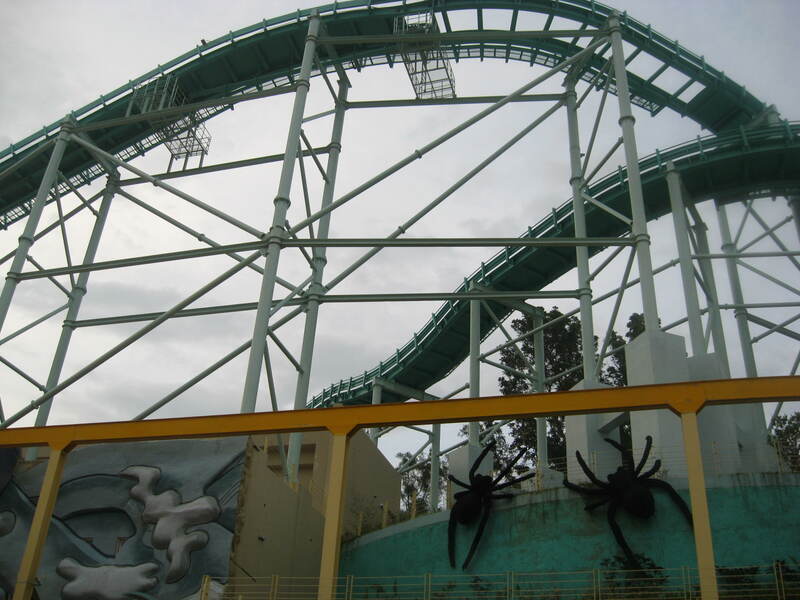 Standing 50 feet tall, the ride was similar boat wise to Intamin, but active lap bars were retained for all installations. The drop was simpler: 45 feet tall at 35 degrees angle. 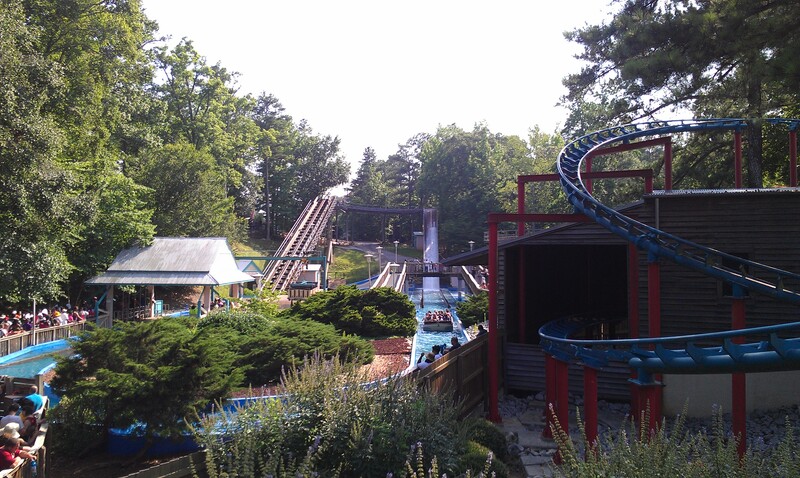 Oval layouts are standard and roller coaster style chain lifts are used to take boats up the lift hill. Hopkins offered at the time the option to parks to either have steel or wooden supports. 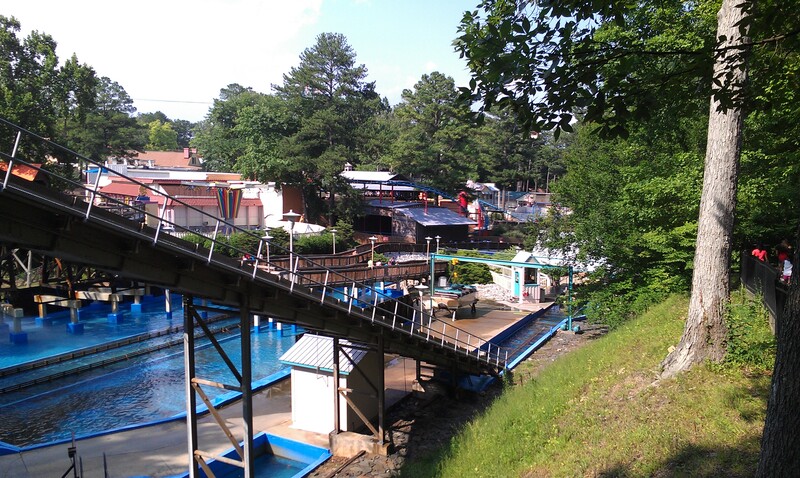 The top 3 pictures show Splashwater Falls at Six Flags Over Georgia (Austell, GA). It was one of the initial 1986 installation and this one use the chain lift and steel supports. 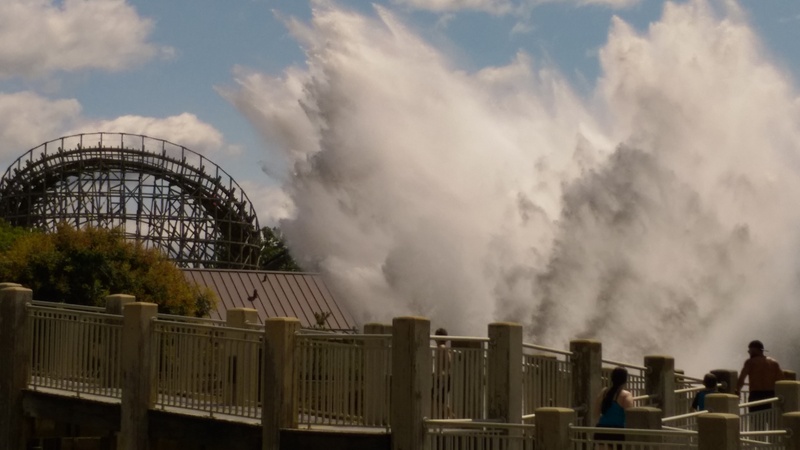 One of the boat on the Tidal Wave at Six Flags Saint-Louis (Eureka, MO) starting to drop. 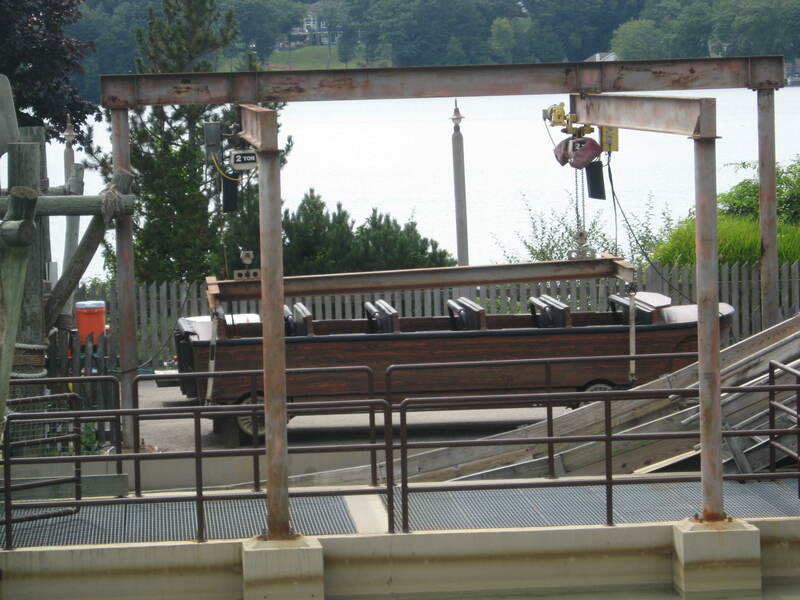 One of the boat on the Boston Tea Party at Canobie Lake Park (Salem, NH) stored next to the lift hill. The elevated winch system is used to transfer boats in and out. Boston Tea Party has a wooden lift structure. 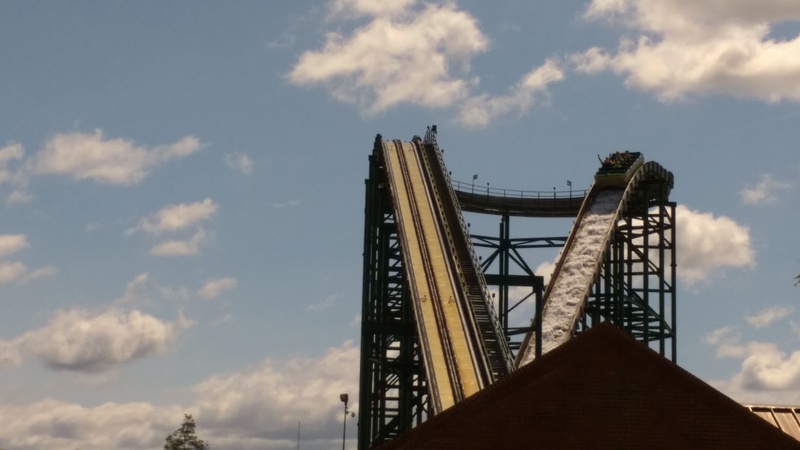 To get the ride approved by the city of Salem, the park had to cover the drop with a clear tunnel. This was to make sure the ride screams did not carry across the lake. The ride large run out lake. The preceding pictures show the huge wave generated by the boat. 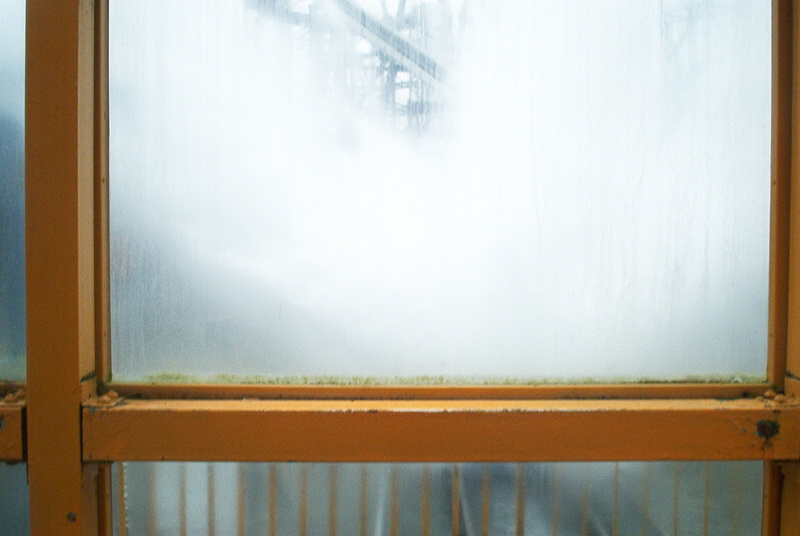 It reach even further than the turnaround into the station and soak the souvenir building next to the ride. There are however three exceptions: From 1987 to 1989, O.D. 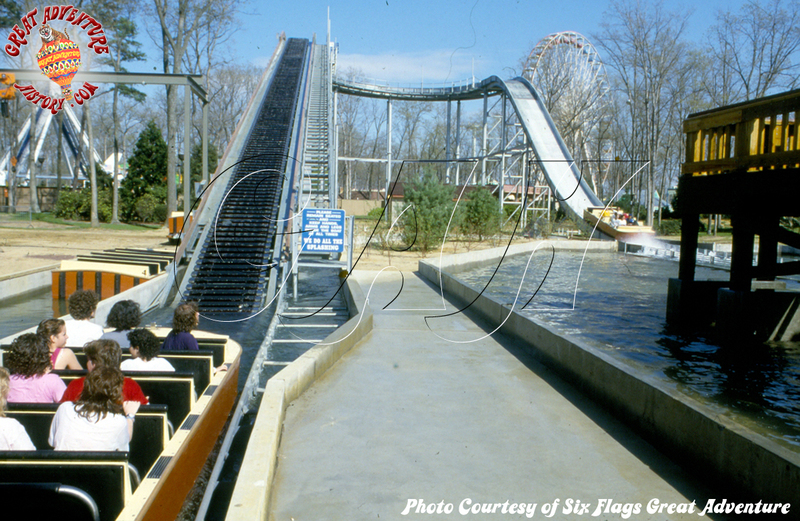 Hopkins designed three Shoot the Chutes that used an Intamin style lift hill to take the boats up. 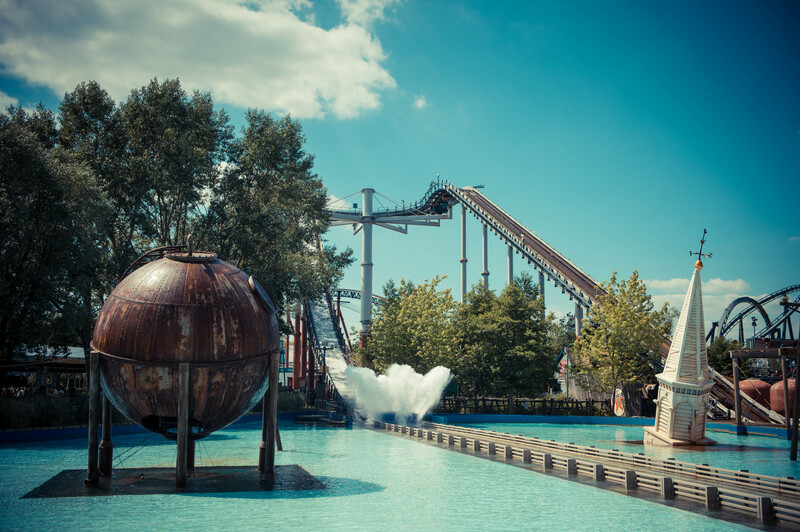 The first one opened in 1987 as Splashwater Falls at Six Flags Great Adventure (Jackson, NJ), in 1988 at Carowinds (Charlotte, NC) under the name Whitewater Falls and in 1989 at Canada’s Wonderland (Vaughan, ON) as Timberwolf Falls. 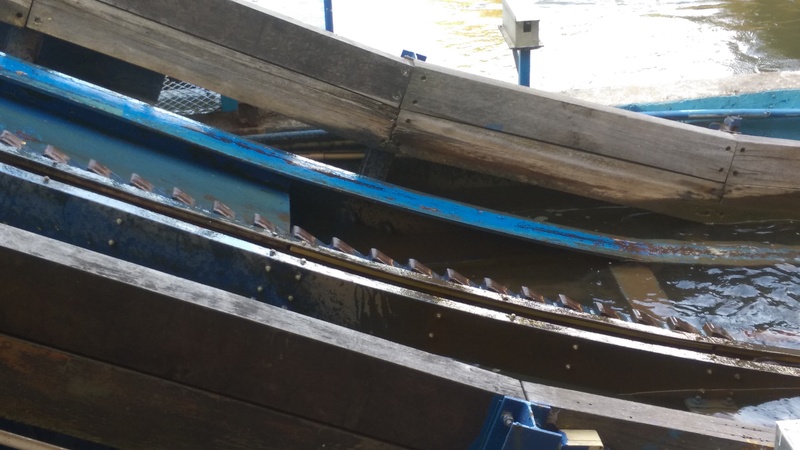 http://www.greatadventurehistory.com/ provided this picture of the lift hill on the Splashwater Falls/Movie Town Water Effects at Six Flags Great Adventure. It opened in 1987 and closed 20 years later in 2007. 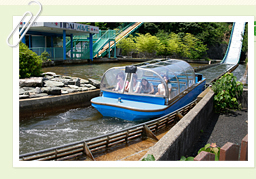 In 1992, Miyaki Park in Misaki, Japan opened Tidal Wave, a standard 50 feet tall Shoot the Chutes. What make it unique? The fact it was the first Shoot the Chutes ride to have a covered boat. In 1994, a new line of Shoot the Chutes was introduced. It featured either an 82.5 or 100 feet lift hill and a figure 8 layout. 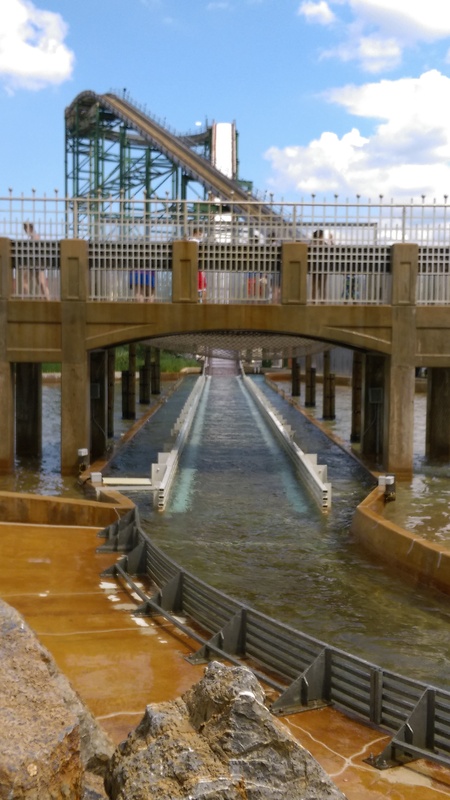 The boat would go down the steep drop under the lift hill and create such a large wave of water that the spot on the bridge in front of the drop at Hersheypark (Hershey, PA) was altered with a clear wall. 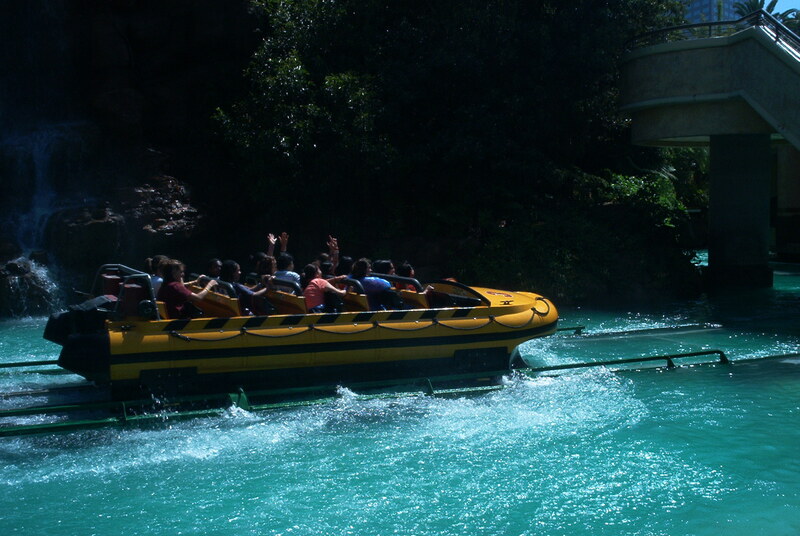 Tidal Force wave is so powerful that there were incidents where people crossing the bridge were swept off their feet. Having those walls mean that people on the bridge only receive the water that crested and fall down behind. 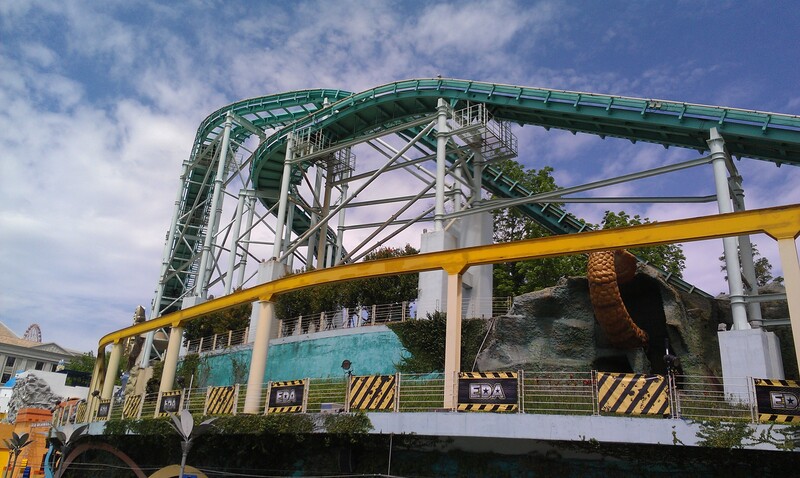 This is one of the three boats on the Shoot the Chute at Nagashima Spaland (Kuwana, Japan). You can see the figure 8 100 feet tall structure of the ride. The ride huge splash down lake and runoff. Clear walls were installed on the bridge to absorb the direct impact of the wave. The wave generated by the wave. 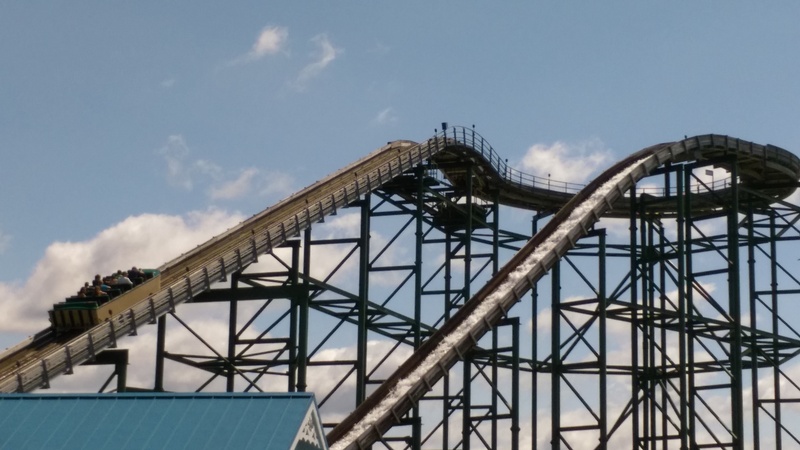 A boat climbing the lift hill on the Hersheypark Tidal Force. Notice the figure 8 layout on the Hersheypark Tidal Force. The giant wave created by the Tidal Force. Notice the long runout required by the speed of the boats. 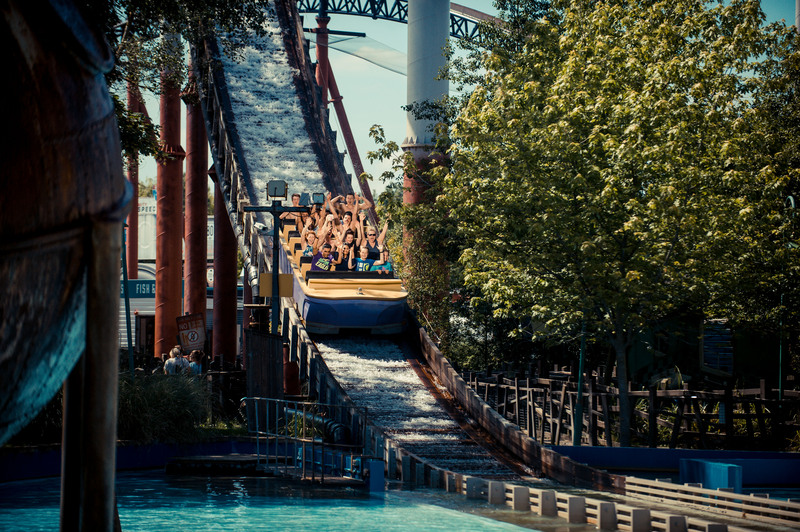 In 2000, a custom 85 feet tall Shoot the Chutes with an oval layout opened at Thorpe Park (Surrey, UK). In order to minimize the supports needed and to fit the site, a christmas tree like structure is used to support the elevated trough. 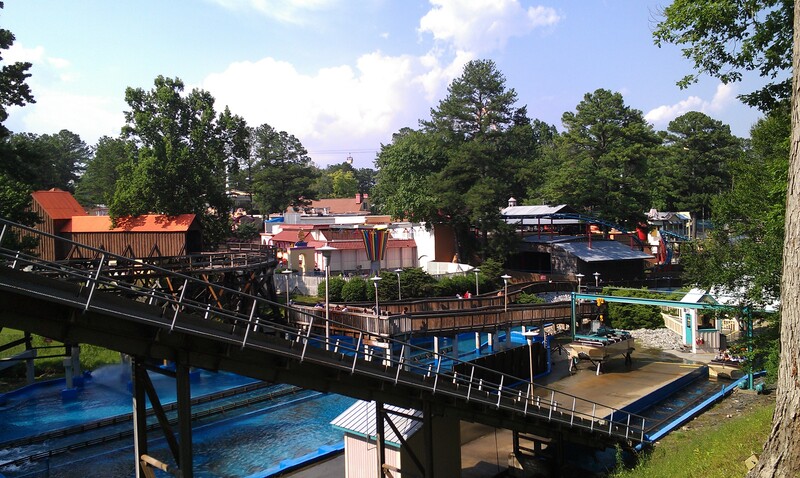 The ride loading station is a half submerged cannery, as it is located into the hapless city of Amity Cove. The cannery, a church and various other buildings have been flooded by the Tidal Wave. Amity Cove (spray painted to CALAmity Cove on a collapsed highway sign) also included various other effects such as a ruptured gas tank that would shoot fire every 10 minutes. The boat coming down the drop. You can see the tree like structure for the elevated portion. 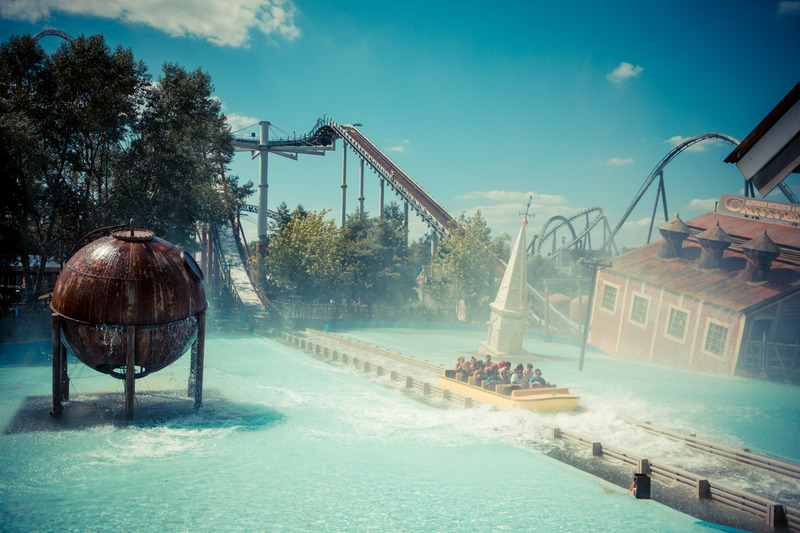 Following the 85 feet drop, the boat reach 45 mph as it hit the water, creating a huge 40-45 feet tall wall of water. 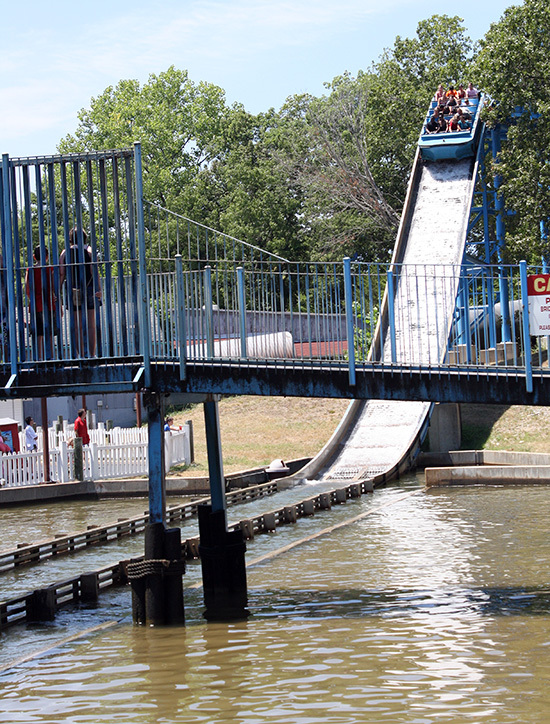 In 2002, Playland Park (Rye, NY) opened the Playland Plunge, a new Shoot the Chutes ride. Like at Thorpe Park, a Christmas tree like structure is used for the elevated portion, except this ride is 50 feet tall and use smaller boats. They have 4 rows of 3 passengers. In 2002, after undergoing bankruptcy protection, the company was split off. Hopkins Rides was sold to Reverchon Industries from France and the sky ride/ropeway division spun off as “SkyTrans Manufacturing”. Most of the original technical staff remained with Sky Trans and Reverchon acquired the patents, ride designs and a few staff members transferred there. That division was later sold to Martin & Vleminckx and then again to the current owner, WhiteWater West Industries Ltd. WhiteWater has been pushing that division under their WhiteWater Attractions division and sold a 25 feet tall Shoot the Chutes to Legoland California (Carlsbad, CA) in 2012. 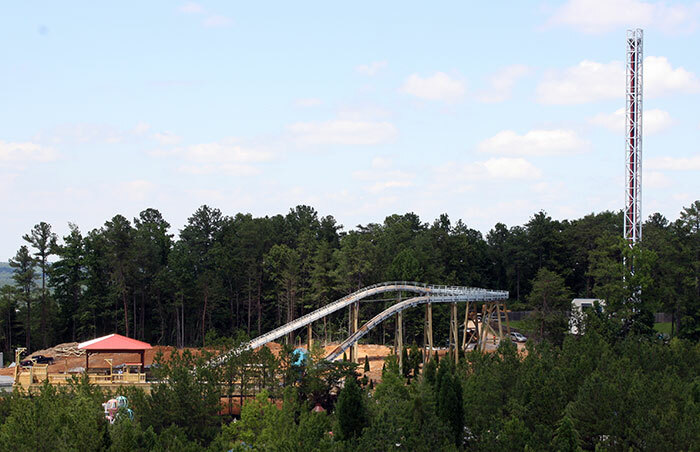 SkyTrans Manufacturing sold in 2011 a brand new Shoot the Chutes to Alabama Adventure (Bessemer, AL). 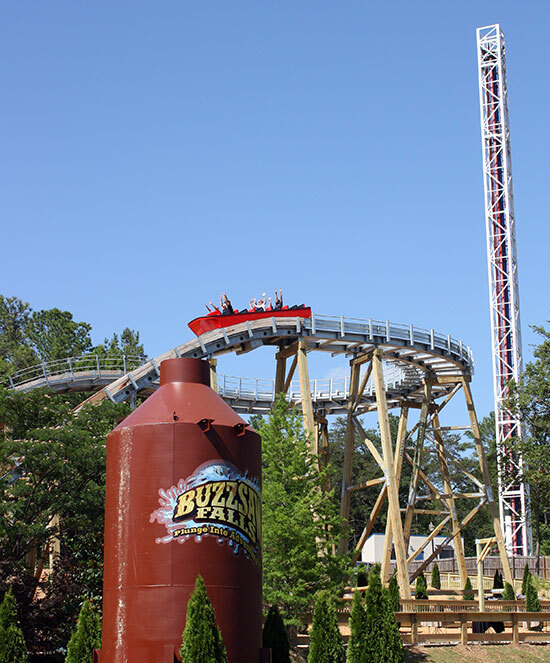 Standing 50 feet tall, Buzzsaw Falls was very similar to the old Hopkins version and was offered at a very competitive price. 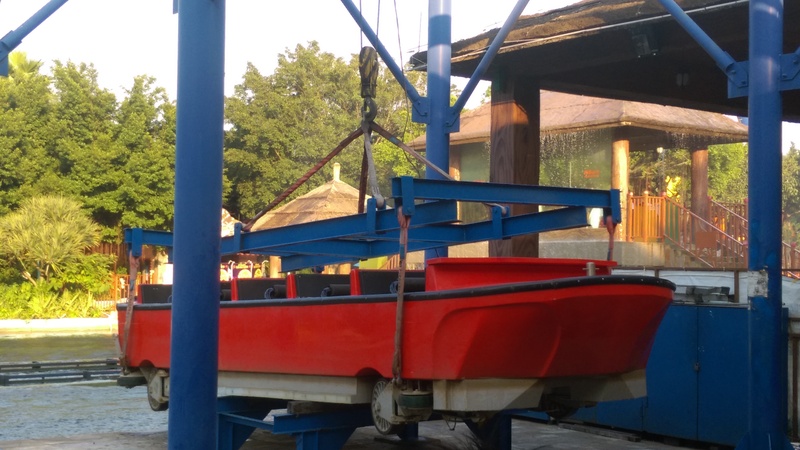 Currently, Skytrans partnered with Zamperla rides to design water rides that will then be marketed and manufactured by Zamperla to parks around the world. So far, no Shoot the Chutes have come out of that partnership. 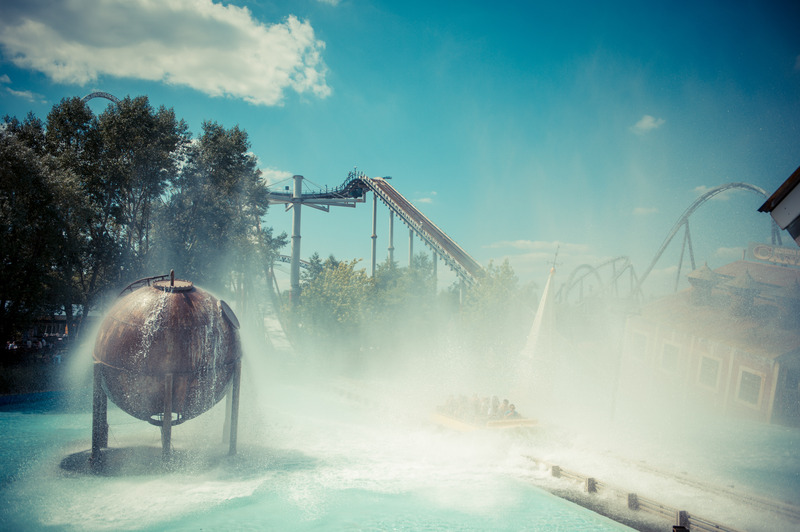 In 1995, Interlink designed and manufactured the Niagara at Bellewaerde Park (Ieper, Belgium). Standing 66 feet tall, it was the tallest Shoot the Chute in Europe at the time. It was delivered with 4 boats and like on some of the Japanese Shoot The Chutes, one of them originally had a clear fiberglass cover to operate during colder weather. 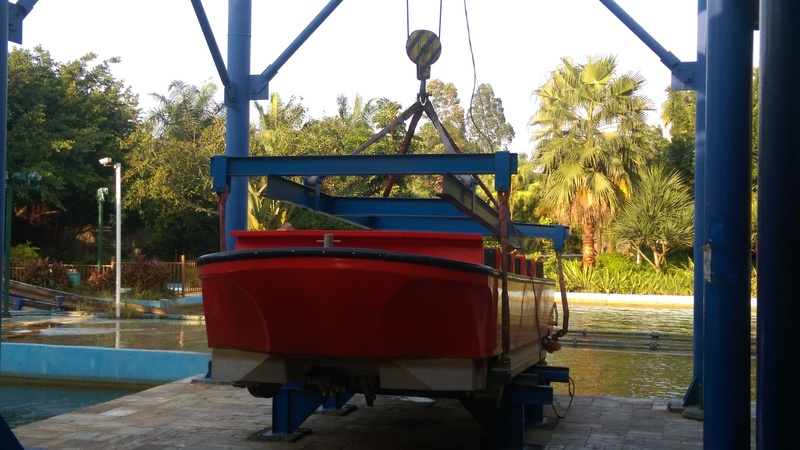 A chain lift hill is used to take the boats up and those boats have a futuristic shape and 5 rows of 4 passengers. Interlink also offer configurations of 10, 12 and 25 passengers for Shoot the Chute installation. Those two pictures show the Niagara at Bellewaerde. The pictures appears courtesy of http://www.bellewaerde.be/en. As previously discussed here, https://parkvault.net/2015/02/06/dinosaurs-mad-houses-and-flying-boats-part-10-of-the-vekoma-retrospective/ , Interlink did the hydraulic and water flow calculations for Vekoma. 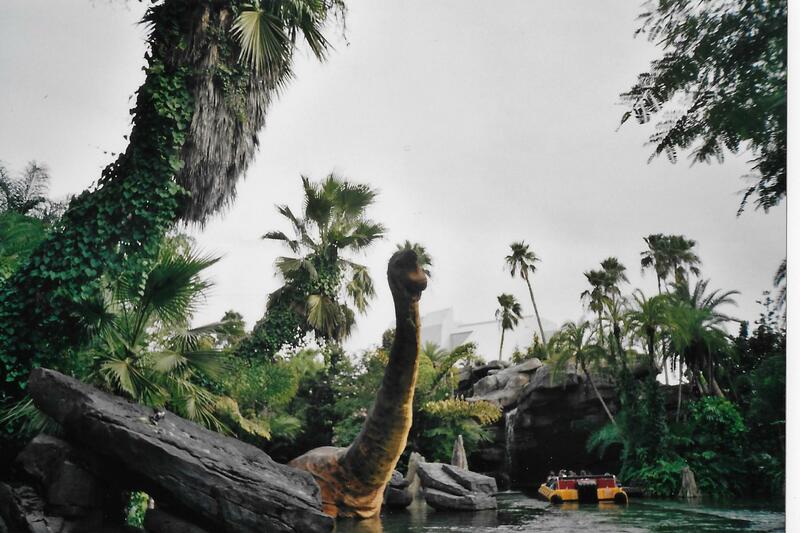 Vekoma then designed the ride system for Universal Creative and delivered three such “Jurassic Park” attractions between 1996 and 2001. 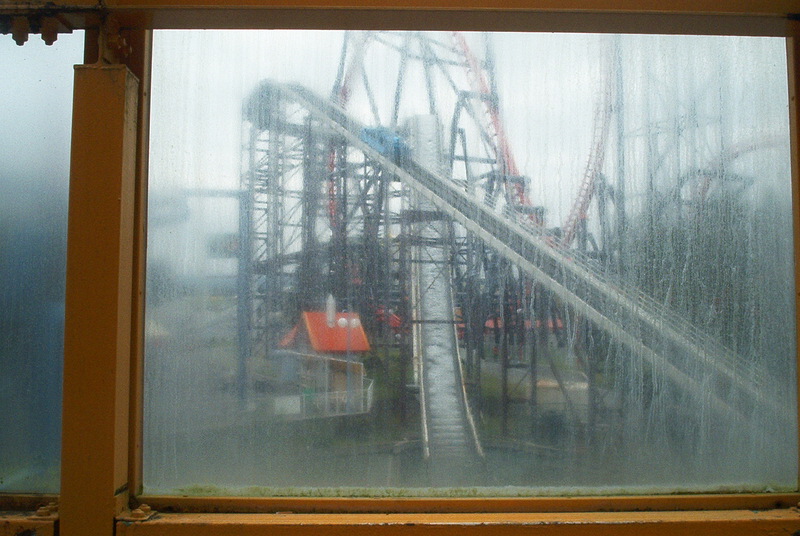 The prototype one had space constraints and thus, the Universal Studios Hollywood installation originally soaked its riders. 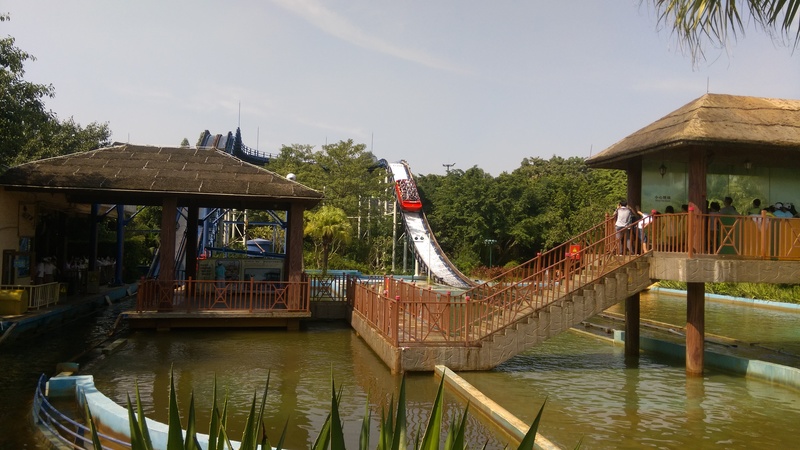 Since it was impossible to make the run out area bigger, they modified the boats with roller coaster car braking fins and installed adjustable magnetic brakes. Thus, they could lower the water level and can control the amount of wetness. 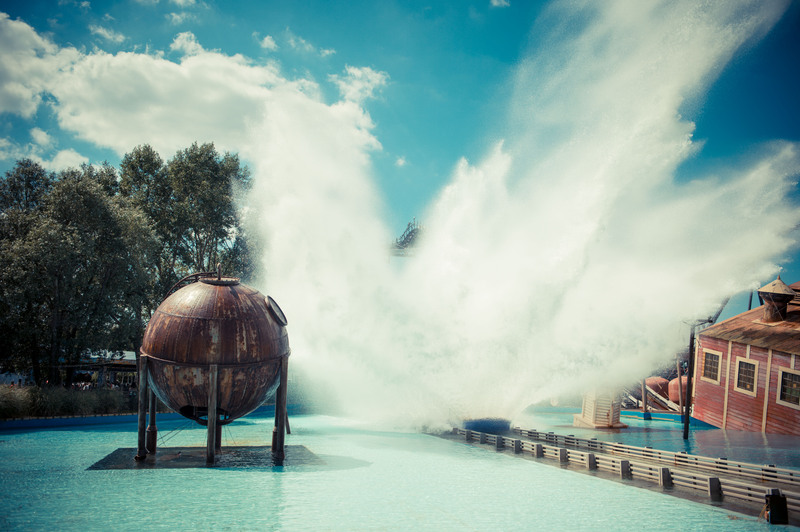 In the summer season, they installed water bombs in the run out lake and those shoot water 100 feet in the air and soak riders and onlookers. 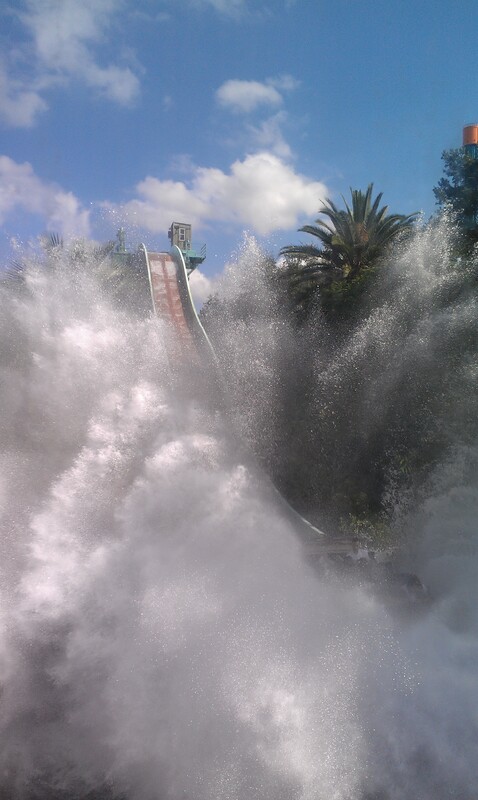 The current splash on Jurassic Park: The Ride at Universal Studios Hollywood. Notice how high the boat sit above the water. 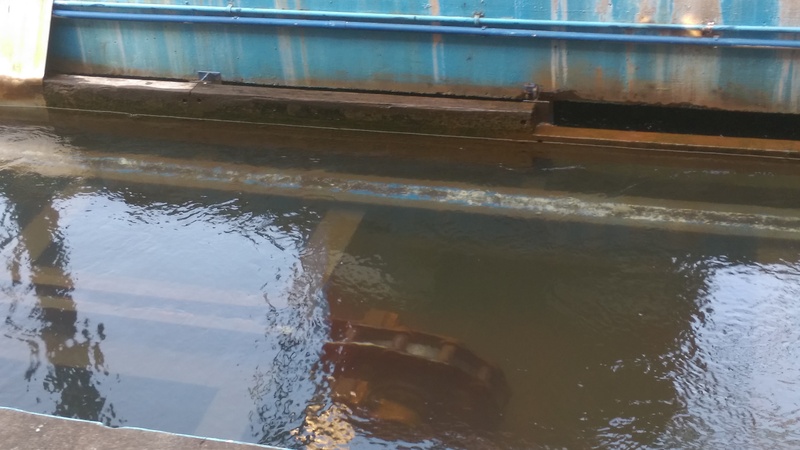 You can see the eddy-current magnetic brakes in the water. Pusher tires are installed at the end of the run out to give the boat a push in case it was trimmed too much. 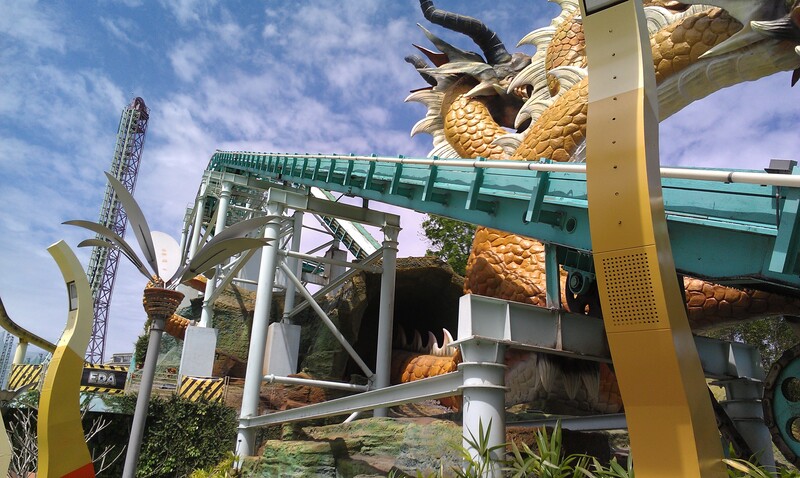 For the Universal Studios Japan (Osaka, Japan) and the Islands of Adventure (Orlando, FL) version installations, those were brand new parks and the run out area is larger and they don’t require the magnetic eddy-current brakes. 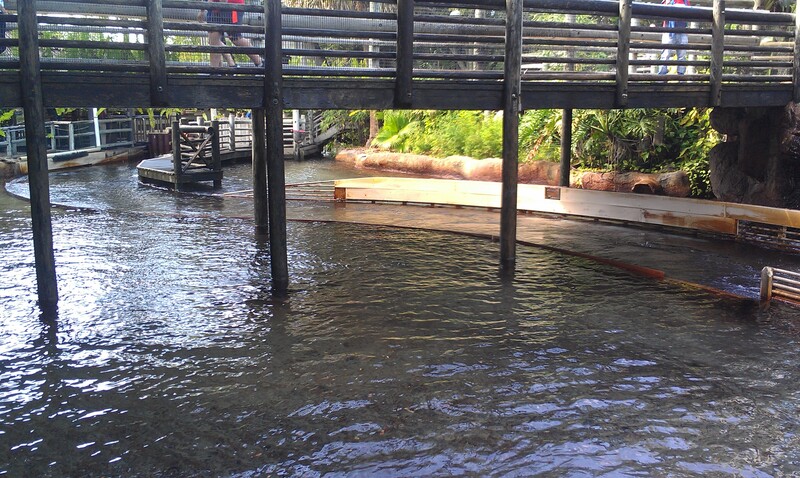 This is the first scene on the River Adventure at Islands of Adventure. In 1984, Arrow-Huss designed their own version of the Shoot The Chutes, the first of the modern era. The prototype model was the Shoot The Chute at the 1984 World Fair in New Orleans, LA. It stood 55 feet tall and was the headlining ride at the World’s Fair… A roller coaster chain lift is used to take boats up the lift hill. It had an oval layout and there were a few unique things about it that made the Arrow version stand out. 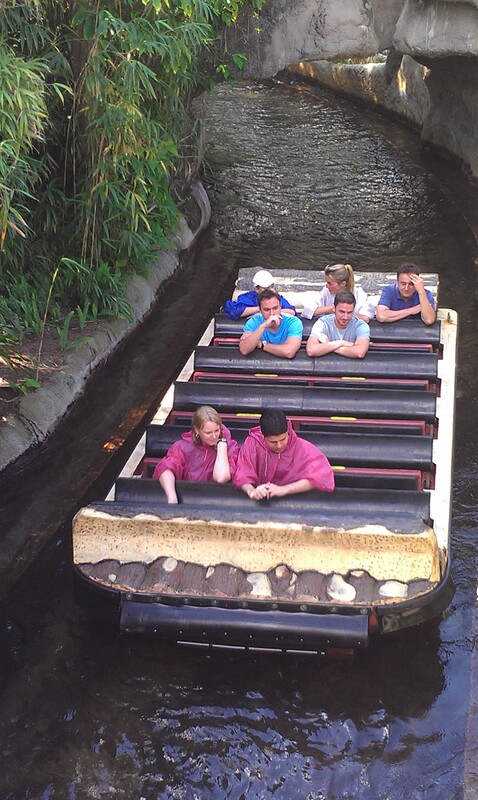 For example, it used a fiberglass trough similar to a log flume and it floated among the elevated portion. 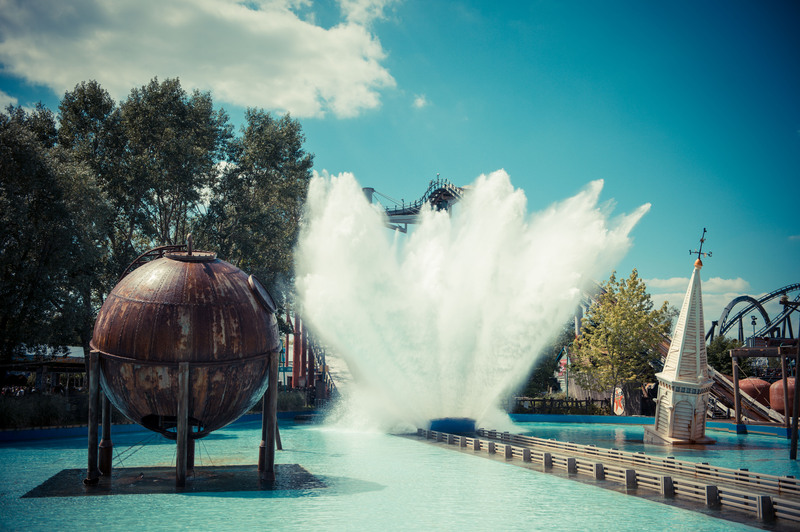 Meanwhile, the standard Hopkins, Interlink and Intamin rides roll in a steel trough on gravity and a small amount of water is used which then goes down the drop. 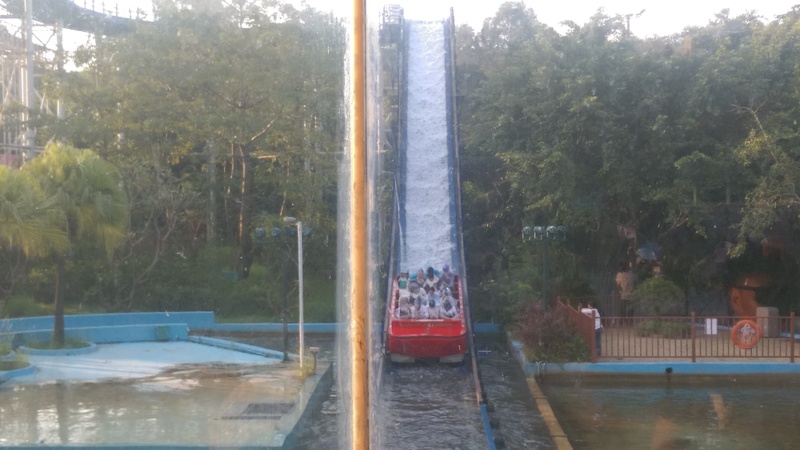 Then, before the large drop, you had rubber belts that took the boat up a bit and thus, in case of a problem at the bottom, the boat can be stopped before dropping. 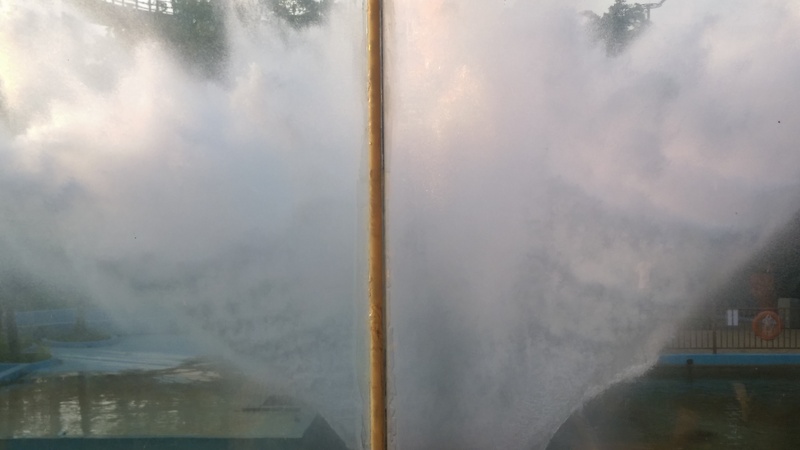 The boats had a shape that pushed more water in front of them in a large wave. Due to the World’s Fair bankrupcy, Arrow-Huss reorganised back into two companies with Arrow becoming Arrow Dynamics and Huss becoming Huss Maschinenfabrik. Shoot The Chute was eventually sold to Six Flags which then relocated it in 1986 at Six Flags Astroworld (Houston, TX) as the Tidal Wave. 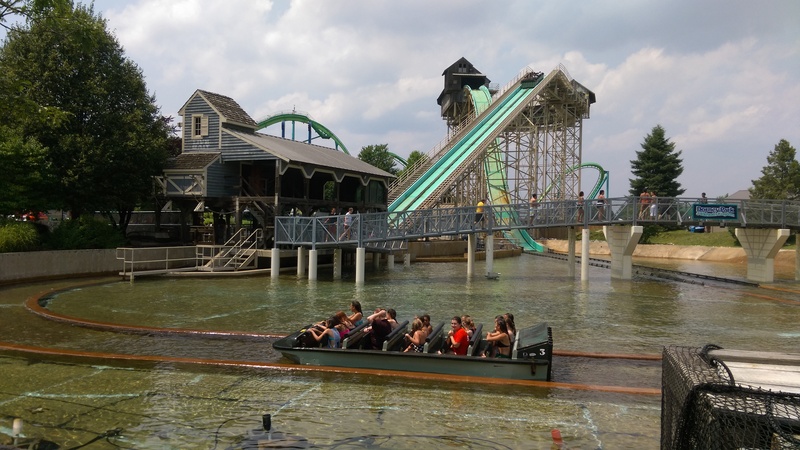 In 1989, Busch Gardens Tampa (Tampa, FL) transformed the African Queen boat ride into the Tanganyika Tidal Wave. 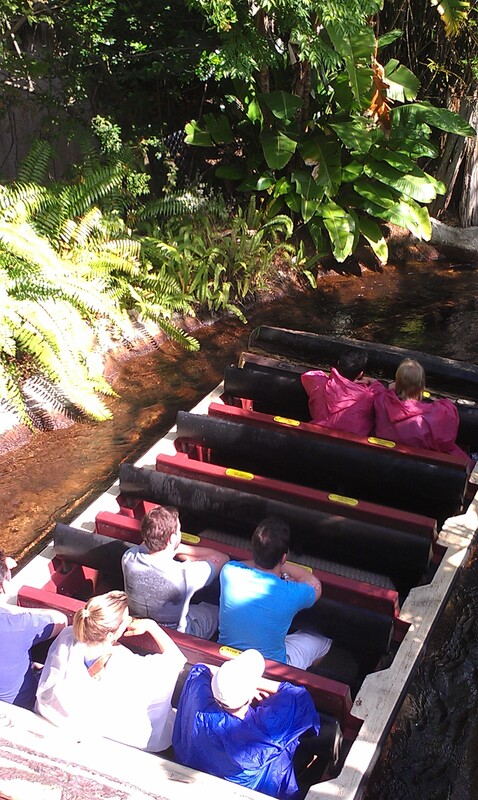 It retained most of the scenery of the previous Jungle Cruise like experience and then added a large 55 feet tall elevated trough at the end. It then leads to the double down drop that creates a powerful wave. 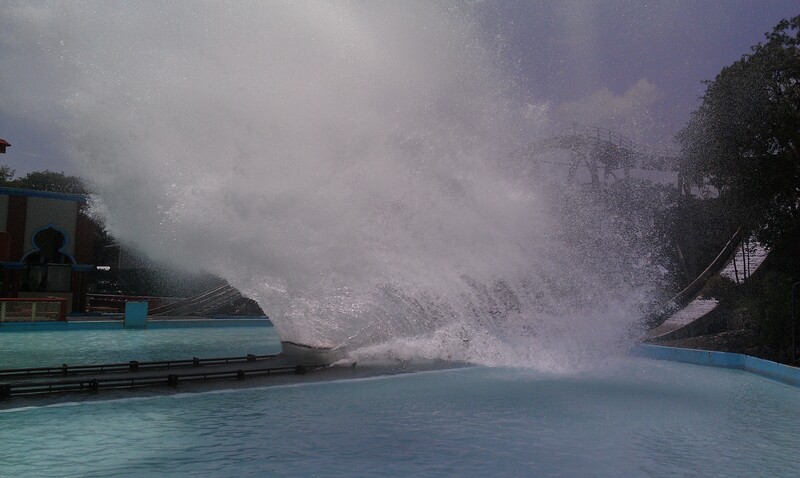 The following pictures show the Tanganyika Tidal Wave at Busch Gardens Tampa (Tampa, FL). Notice how high the fiberglass walls are on the trough compared to the models. 55 feet double down drop. A tight S curve bring the boats back to the station. The boat returning to the station. The ride 20 passenger boats. Riders are restrained with a sliding lap bar per row. 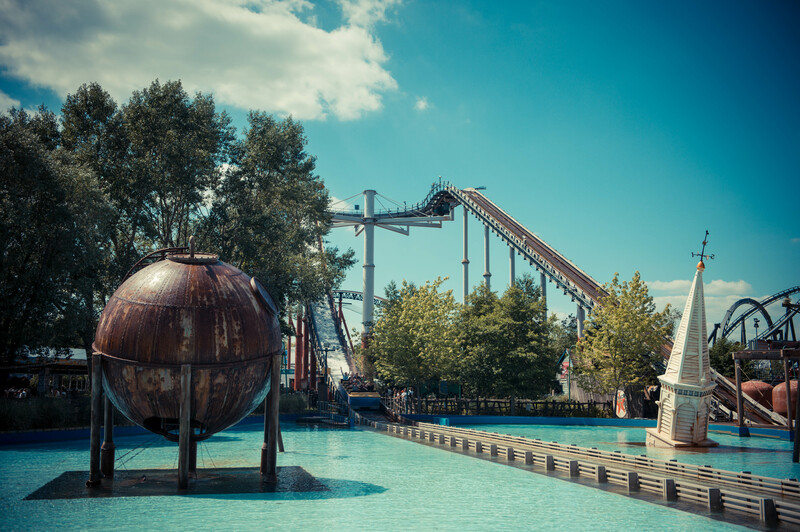 In 1993, Dorney Park (Allentown, PA) opened the White Water Landing and Cedar Point (Sandusky, OH) the Snake River Falls. Both are Arrow Shoot the Chutes attractions that featured a then record breaking 82 feet tall lift hill with a figure 8 layout. Then, the boat floats around a covered tunnel at the top before dropping 80 feet at a 50 degrees angle. 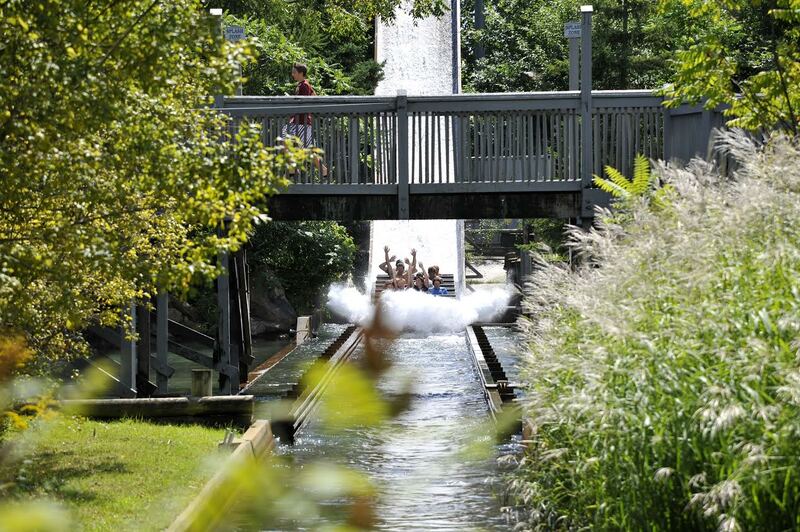 White Water Landing at Dorney Park. Before the boat reach the drop, it creates a larger wall of water on the drop as can be seen here. The wave created by the boat dropping into the water. A boat returning to the station. Cedar Fair at the time themed and enclosed the top of the attraction. 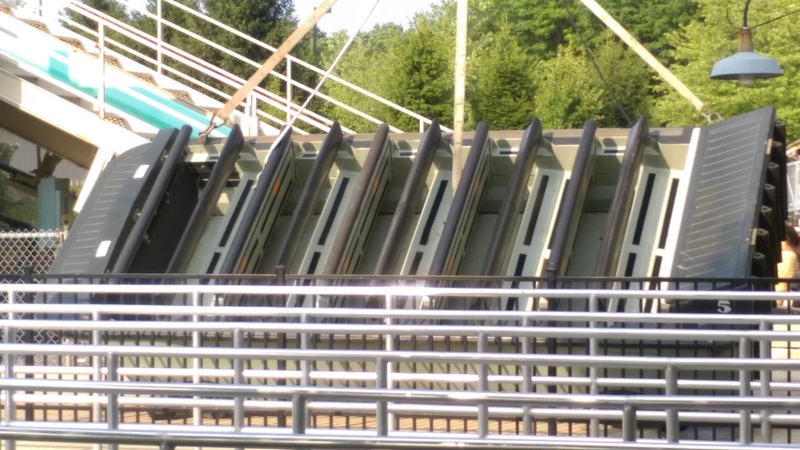 Arrow and Vekoma were the only ones to free float the boats in the elevated sections in all their Shoot the Chutes. 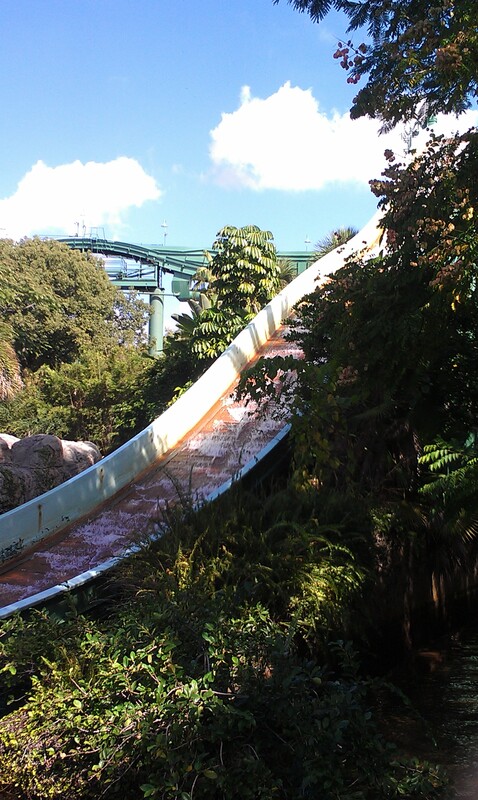 Another view of the attraction upper trough. 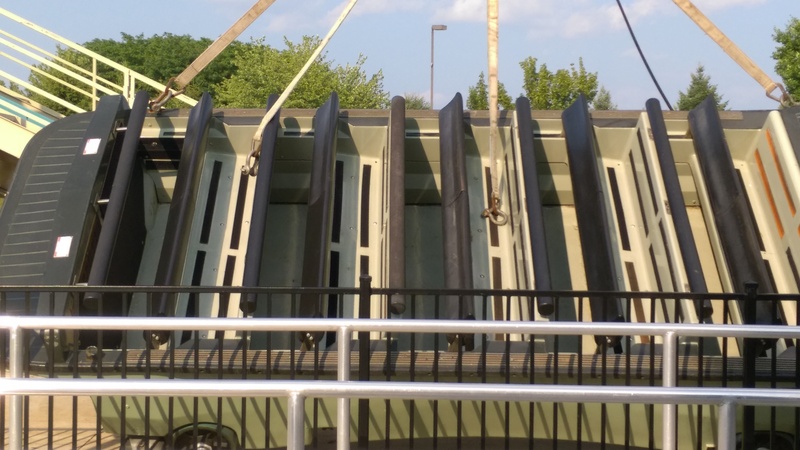 A boat was stored next to the station and you can see the bars and seats. In 1994, the Circus Circus Hotel-Casino in Las Vegas, NV opened the Grand Slam Canyon indoor theme park. Built around a large artificial mountain under a pink dome, one of the park’s flagship attraction was the Rim Runner. 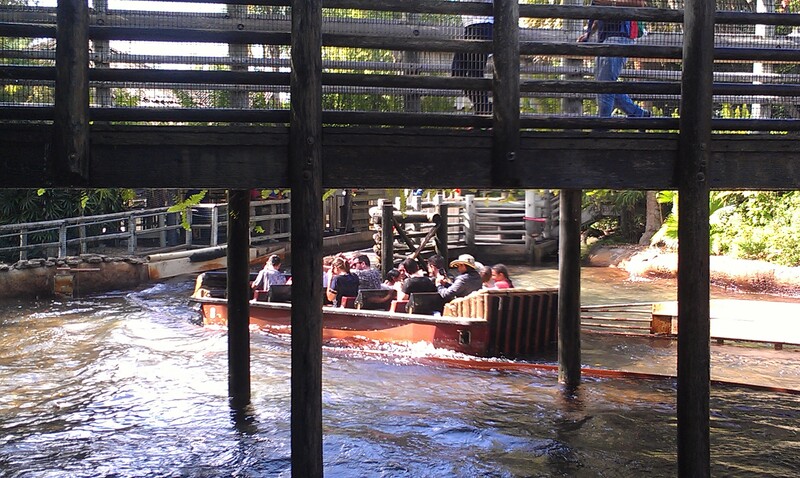 Rim Runner was built on the mountain and featured a 65 feet climb followed by a float past an animatronic tipping rock. 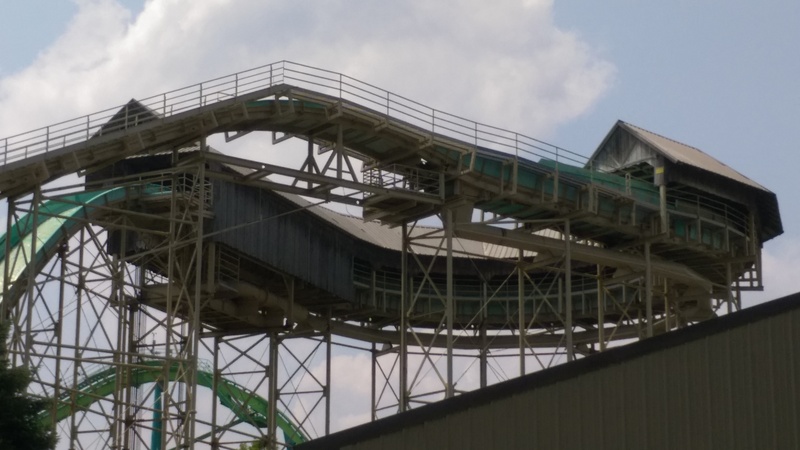 It then went up a small double conveyor belt and then dived down the 60 feet tall double down drop. 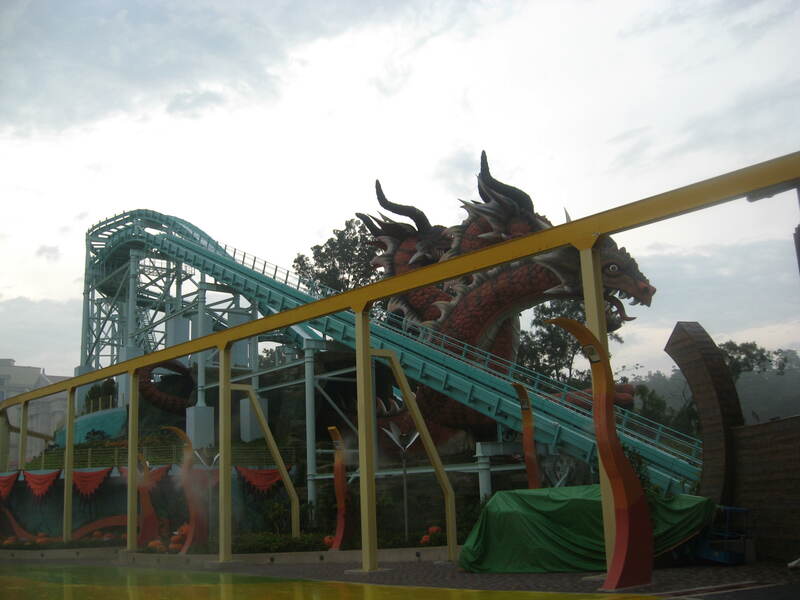 In 2006, for the Happy Valley Beijing (Beijing, China) theme park, Chinese ride manufacturer Golden Horse designed a new ride called the Chute Rides. 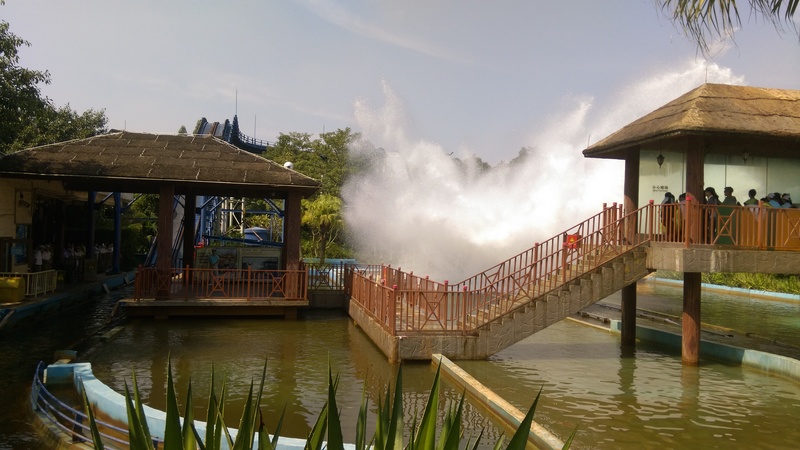 It is a large Shoot the Chute style water ride that use roller coaster chain lifts to take the boats up the first hill and the boats generate the largest waves available right now. 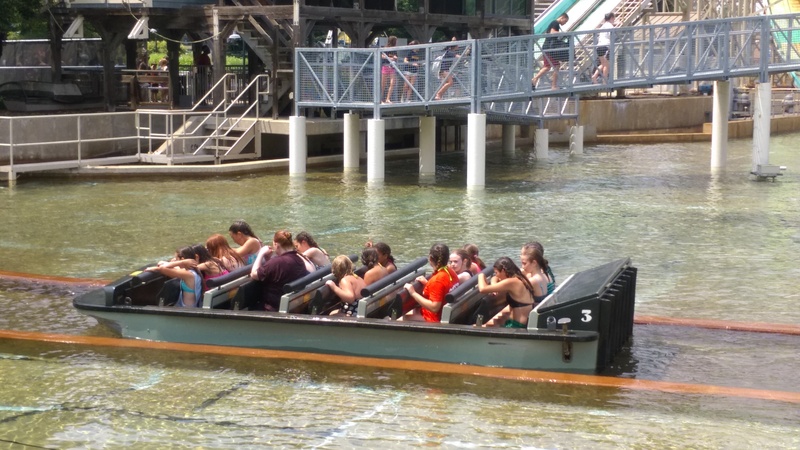 12 or 20 passengers boats are offered and a ratcheting lap bar per row is used to restrain the riders. 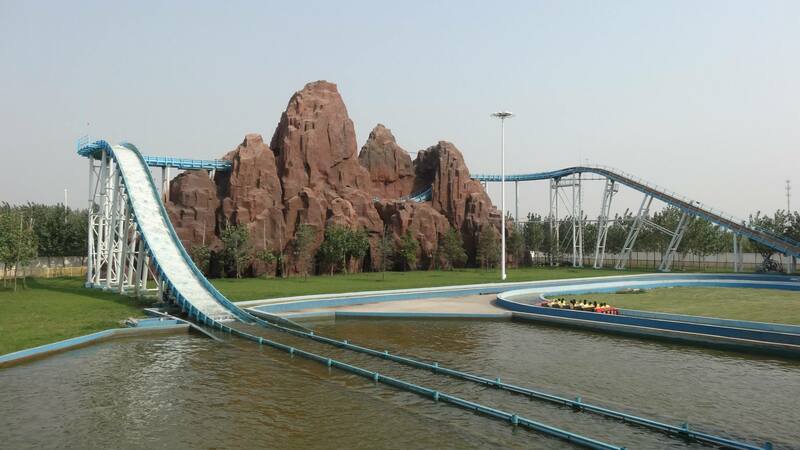 This is a Chute Rides JL-15F present at Victory Kingdom in Wuquing, Tianjin, China. The gravity section is where the mountain is. 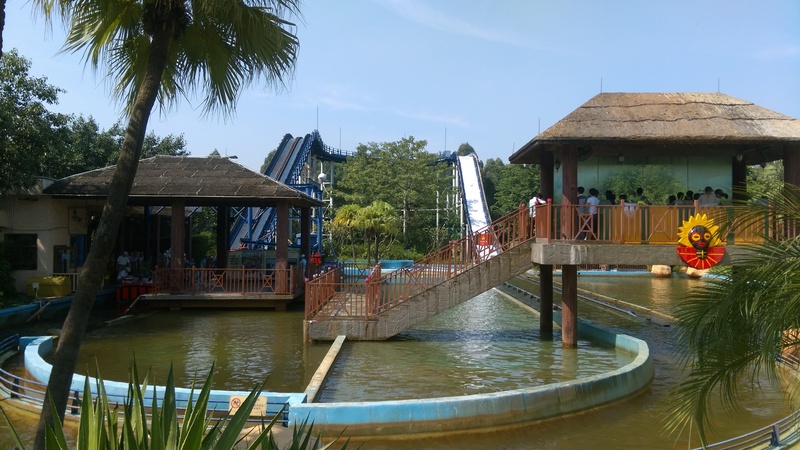 It is a very flexible ride system, as at least two installations feature uphill segments, thus turning them into water roller coasters. It is available with heights of either 55 or 101 feet and Golden Horse will customize the layout to fit the site. 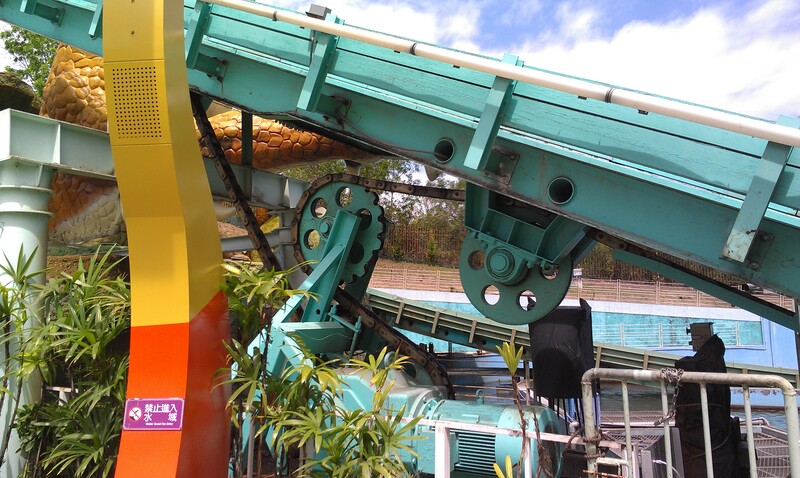 This is Flume Ride at EDA Theme Park in Kaohsiung, Taiwan. 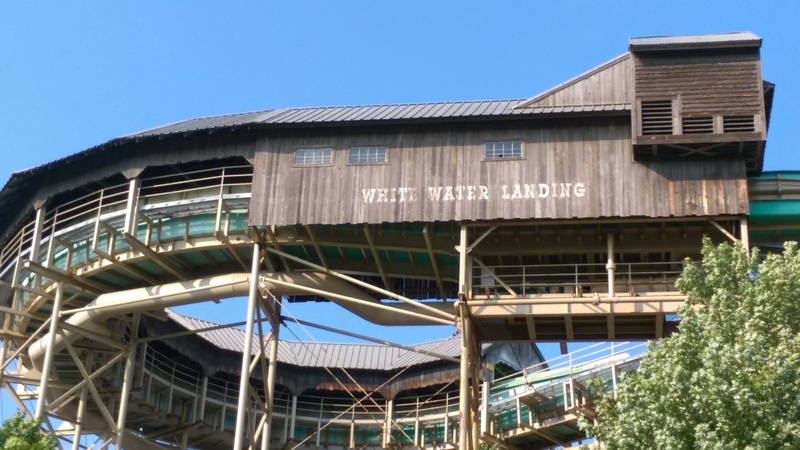 It features two lift hills and a 31 meters drop at the end. It is a JL-30B Chute Rides. You can see the first of two downhill gravity sections. You can see the two lifts cross each others in this picture. The chain lift tension assembly at the bottom of the first lift. 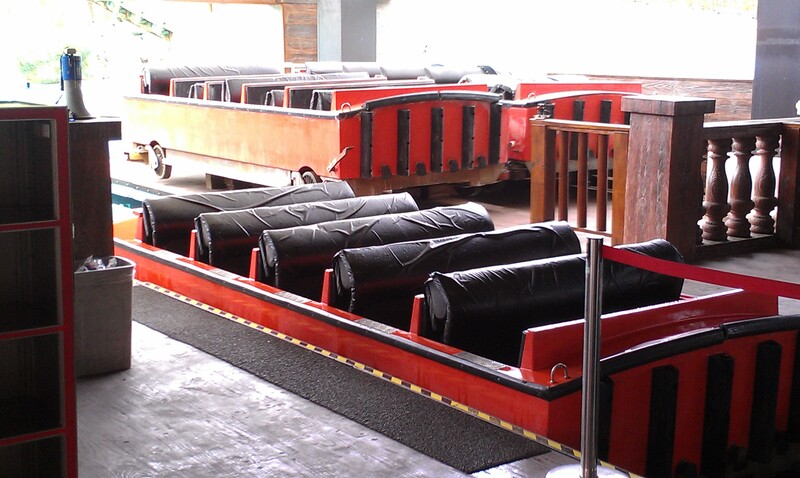 The station and gravity block section use large rubber tires connected to motors to stop and move the boats. The 20 seats boat features a large lap bar per row. 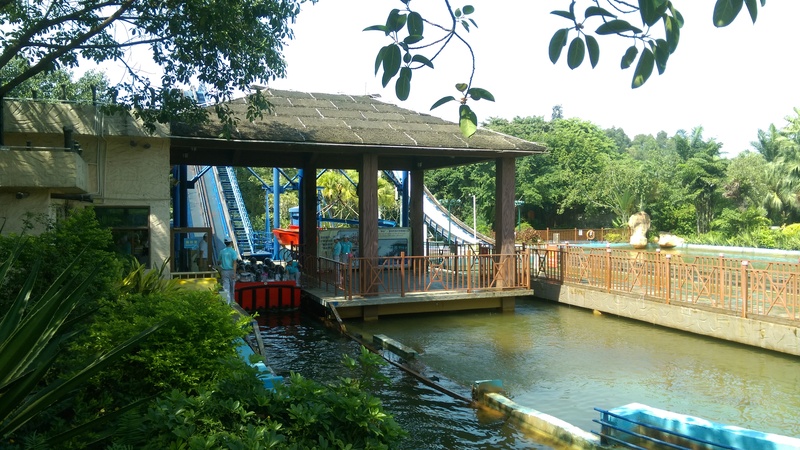 Chimelong Paradise (Guangzhou, China) features two Golden Horse water rides: a Shoot the Chute and a River Rapids. 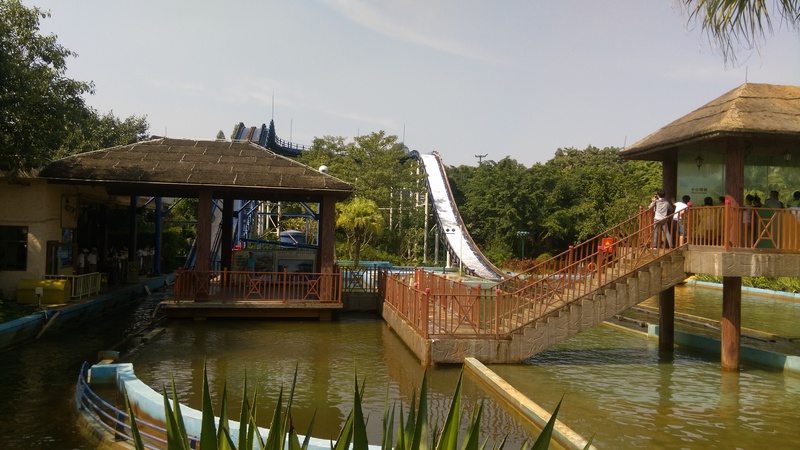 The River Rapids will be presented in a further article and their Shoot the Chute is a Golden Horse JL-15B due to its 15 meters (49 feet) drop height. It has a fairly standard layout and has two boats. The loading station. One boat was in use during our visit. The upper trough is dry and the boat coast on gravity toward the drop. The water is only present on the drop. For a 49 feet tall Shoot the Chute, the resulting wave is huge. View of the boat arriving in the water from the bridge. The wave from the bridge. 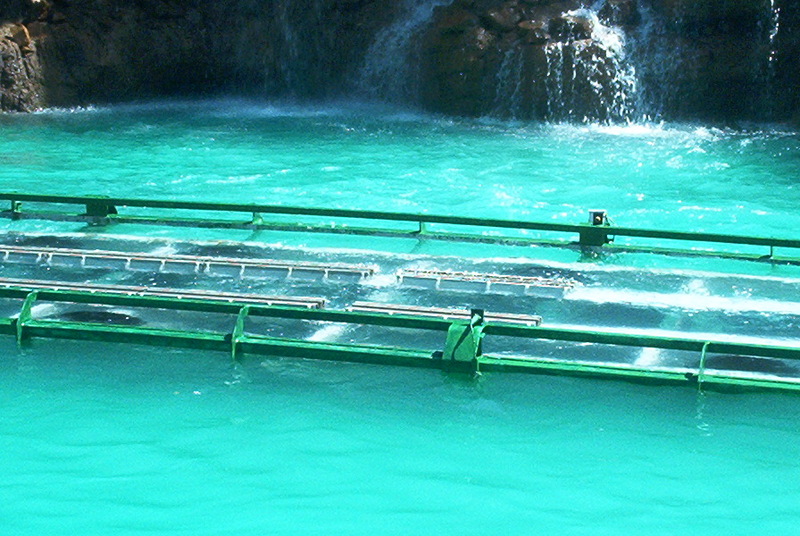 The chain lift start in the water. The lift chain and notice the wooden guide boards. The total ride height is 54 feet with the trough reaching 52 feet high. 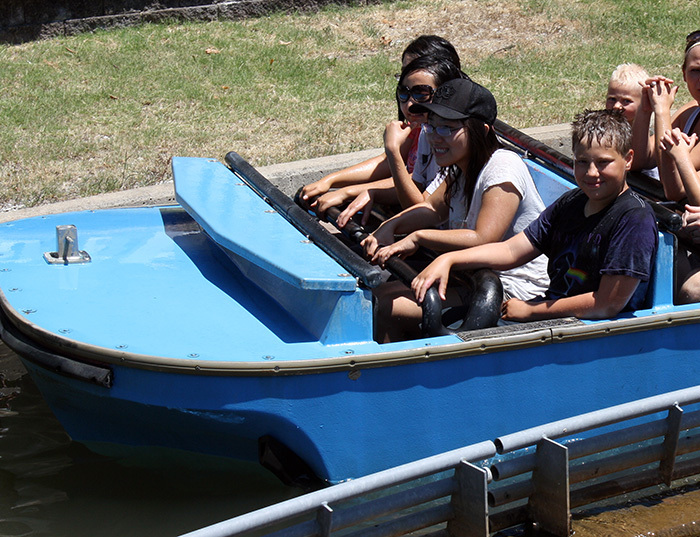 The second boat of the attraction. The chain dog is on the right on the bottom and the double anti roll backs on the left from our vantage point. 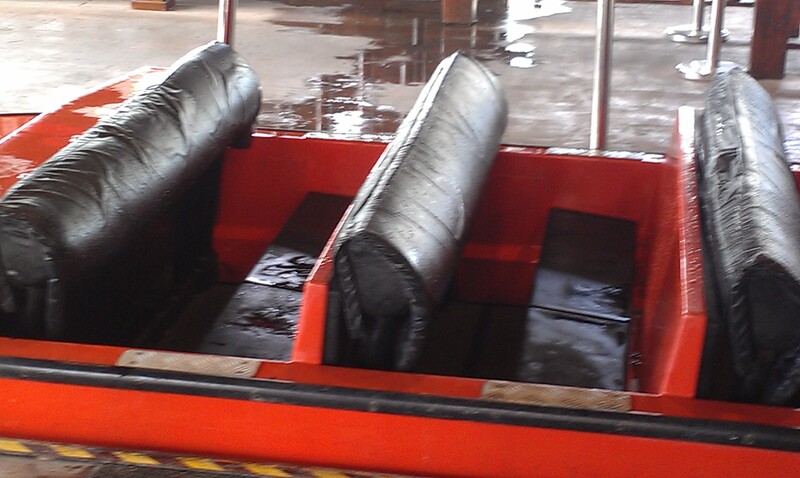 The lap bars here do not have the extra padding present on the EDA Theme Park model. 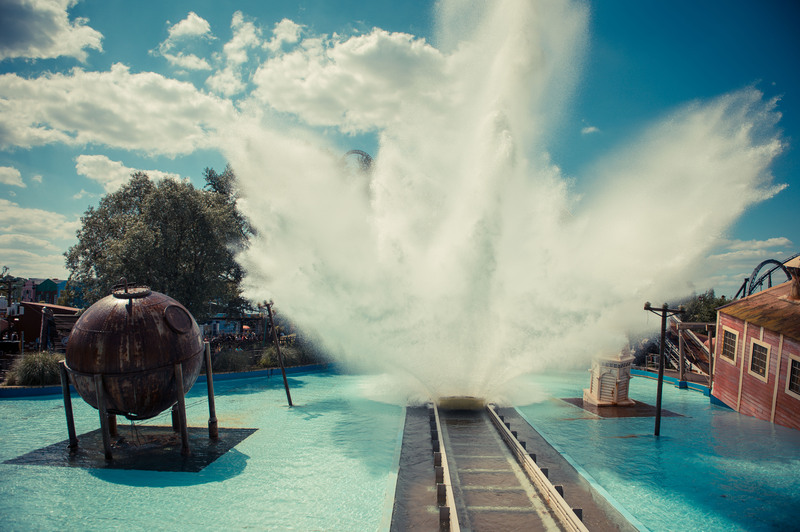 This entry was posted in Water Ride and tagged Arrow Dynamics, Busch Gardens Africa, chimelong paradise, E-DA Theme Park, golden horse, happy valley, Jurassic Park River Adventure, Jurassic Park The Ride, six flags, Snake River Falls, Thorpe Park, Tidal Wave, Vekoma, water ride, WhiteWater Attractions, whitewater west. Bookmark the permalink.